Quick quiz: Name two movies that have all of the following: a Jeep CJ-3B, a 2WD Dispatcher Jeep, and a bunch of surfboards. It wouldn't be an easy Trivial Pursuit question, particularly because most of the Jeep appearances are brief and distant. A Surrey also appears in a night scene later in the film. 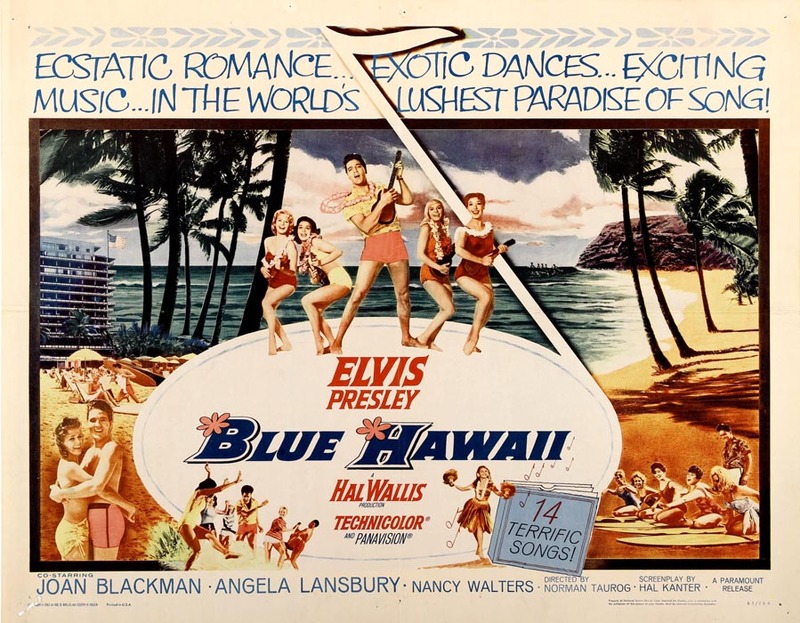 Blue Hawaii set the tone for Elvis' future film career -- pretty locations, gorgeous girls, thin stories and mediocre songs -- but it was one of his most successful films. Presley's remake of the title song introduced it to an audience too young to remember Bing Crosby's original version from the 1937 film Waikiki Wedding . 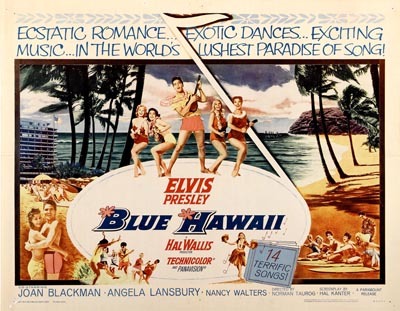 In the slim plot of Blue Hawaii , Chad Gates (played by Elvis) has just gotten out of the Army, and is happy to be back in Hawaii with his surfboard, his beach buddies, and his girlfriend (although he and the stewardess seem to have enjoyed the flight home.) For an entertaining plot summary, see Theory of Chaos. Perhaps the most exciting moment in the film comes as Chad is welcomed at the airport, because we catch a glimpse of a CJ-3B on the tarmac, modified to carry a luggage loading ramp. Steve Mehls spotted this Jeep in Blue Hawaii . See more Airport Jeep Photos on CJ3B.info. Three decades later, but with a plot that's just as thin, the 1998 film In God's Hands follows the adventures of three surfers as they travel to Madagascar, Bali and Hawaii in a search for the ultimate wave. 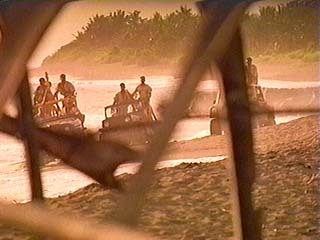 The nice cinematography by John B. Aronson includes this shot of the local African military arriving to shut down a beach party and round up the beach bums. 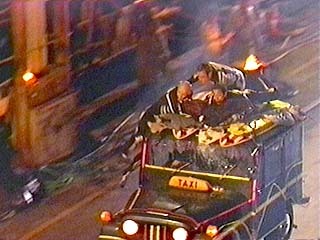 The surfers manage to escape from jail, and dressed in skeleton suits, they hitch a ride with their surfboards on a Postal Jeep taxi, in a wild nighttime chase scene. In God's Hands was directed by Zalman King, who in the days of the CJ-3B was an actor, appearing in TV series including Gunsmoke, The Munsters and The FBI. Also on CJ3B.info, see another Postal Jeep movie chase in Addams Family Reunion . See more Presley movies on CJ3B.info: G.I. Blues in Elvis Presley's Jeeps, and Tickle Me in Elvis Jeep Toys. Another movie with surf and Jeeps: Ride the Wild Surf. See more of The CJ-3B in the Movies, and some more Surrey Jeeps in the Movies.